View adverts currently airing on WightlinkTV, a network of 80+ screens on nine ferries and at three passenger terminals. WightlinkTV is now managed by Bob Ede TV. Please click HERE to be redirected to Bob Ede TV. Thank you. ”We saw you on the ferry…” a remark that OnboardTV clients tell us they often hear; their business profile raised and put firmly on the map. They are enjoying increased footfall from Isle of Wight visitors and locals alike, making their way from the ferry and through their door. 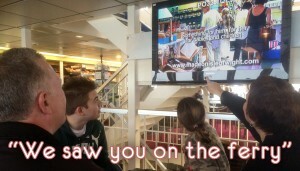 They know just where to find what they are looking for – they saw it on the ferry…! OnboardTV offers several airtime options to suit your budget. Airtime is available on all three Wightlink ferry routes: Ports/Ryde (2 x foot passenger catamarans), Ports/Fishborne (4 x car ferries), Lymington/Yarmouth (3 x car ferries + Lymington terminal). 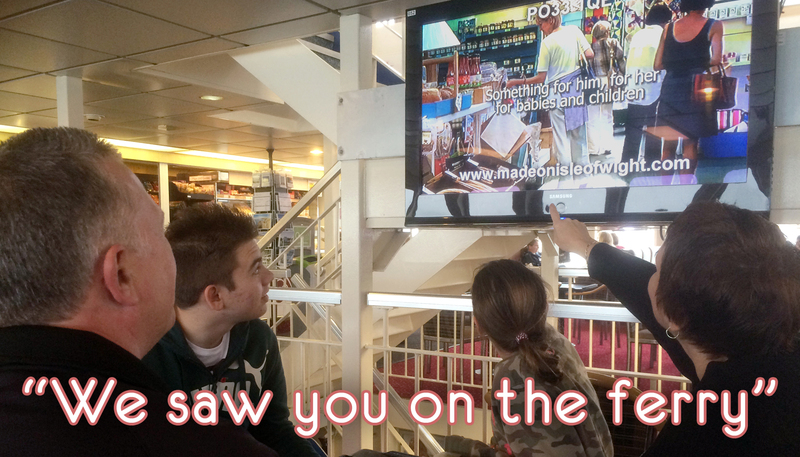 We also have screens at Ryde pier-head and Portsmouth Harbour terminals for passengers waiting to board the catamaran service. Advert durations are usually 30 or 60 seconds (longer by arrangement) and will screen once per sailing (or twice by arrangement). Airtime is normally booked in three month periods (shorter periods are available on request). The more three-month airtime periods and the more routes you book, the greater your discount – up to 50% for a 12 month campaign, showing on all three routes. You choose the placement of your advertisement. We take your brief (free advice is readily available should you need help). Arrange a mutually suitable filming date and film at agreed location/s. Produce your advertisement and once approved by you, put it to air. A copy is available for your business website or to show on your business premises (upon request). You may also update your advert once a calendar month if you wish. We now offer the opportunity of hosting your advert on our website. 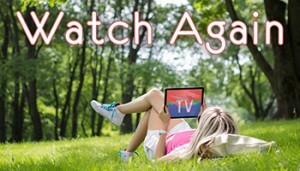 Our ‘Watch Again’ service is promoted across our network of 80+ screens inviting passengers to ‘Watch Again’ on-line, whenever and wherever they want. They can remind themselves of your business or event and benefit from additional information that can run alongside your advert including links to your website, QR codes, special offers and voucher codes. Showcase your advert here with our 'Watch Again' service to provide viewers with the opportunity to remind themselves of your details, read additional information, discover offers, vouchers and links to your websites. If you would like to receive information about our SPECIAL OFFERS for ADVERTISERS, enter your email then click the 'Yes, please send me information' button below. Your details will not be shared. OnboardTV work closely with transport providers to create self-funding digital signage solutions tailored to passenger demographics.